On August 29, 2016 the world lost a wonderful and uniquely talented man in Gene Wilder. Variety reported that he “died Monday at his home in Stamford, Conn. His nephew Jordan Walker-Pearlman said he died of complications from Alzheimer’s disease.” Wilder, born Silberman, was 83. He began acting at 12, worked successfully on the stage before moving on to film and garnering two Academy Award nominations. Wilder specialized in characters whose outward calm could easily melt into full-blown panic or hysteria. But all his work contained a gentle humanity; all you had to do was look into those eyes and there was a sweetness that could not be hidden. Perhaps that’s why he never played a villain in films, I don’t think anyone would have believed him playing a character that was evil. Wilder will be deeply missed and no one can fill that void. But fortunately for filmgoers, he leaves behind a collection of work that we can cherish and enjoy forever. This film is the pinnacle for both Gene Wilder and Mel Brooks. The two collaborated on a number of films and Brooks launched Wilder’s film career with The Producers but this remains their best work. 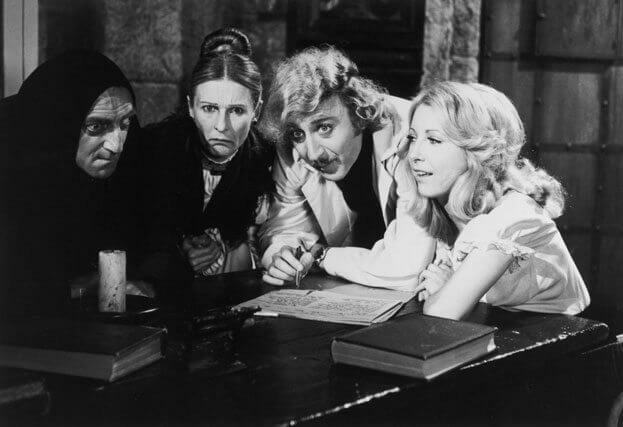 Young Frankenstein is flawless starting with a pitch perfect cast and running through all the technical credits from the production design to gorgeous black and white cinematography. Wilder received his second Academy Award nomination for this film (for co-writing the script with Brooks) and created the memorable Frederick Frankenstein (pronounced Fronkensteen!) who is having a hard time dealing with his grandfather’s scientific legacy. If you only see one Gene Wilder film, you must make it this one because it not only highlights his onscreen acting skills but also his best efforts as a screenwriter. The film drips with affection for Universal’s 1931 Frankenstein and pays homage to the monster genre by sending it up in high comic style. Young Frankenstein is Wilder’s best film but Willy Wonka is hands down his most memorable and beloved character. As Roald Dahl’s famous literary creation, Wilder is irreverent, mischievous, and utterly delightful – plus he sings! The film is a bit uneven but Wilder is perfection as the owner of a massive chocolate factory. Watch his face for subtle, delicious reactions to what’s going on in scenes. This film solidified Wilder’s career as a film star. He plays accountant Leo Bloom who somewhat reluctantly partners with producer Max Bialystock to make money by producing a sure-fire flop. As the neurotic Bloom who easily crumbles under pressure and requires his “blue blanket” to bring him back from hysteria, Wilder delivered a star turn and stole the show from the more veteran Zero Mostel. Brooks met Wilder through his future wife Anne Bancroft who worked with Wilder on stage and recommended him. The film proved to be the first of many collaborations and the two men seemed to bring out the best in each other. This film is comic gold and Wilder’s performance is still reaping dividends. Yes another Brooks-Wilder collaboration makes this list and it’s another homage to Hollywood, this time to the Western genre. Brooks brilliantly pairs Wilder with Cleavon Little and the chemistry pays off in not only big laughs but in characters we just love to watch interacting. Wilder plays Jim, a.k.a. the Waco Kid, a perpetually drunk but good-natured gunslinger. There’s a great chess game among other comic gems. The Producers made Wilder a star but you could see his genius in a supporting role in his first credited screen performance that came out the same year as Brooks’ film. The film was Arthur Penn’s Bonnie and Clyde, a violent, romanticized take on the infamous outlaw tale and Wilder played a young man named Eugene Grizzard who is kidnapped by the bank robbers. Wilder’s Eugene gets along fine with the criminals until he reveals that he’s a mortician and then he’s booted out of the car. It’s a small but highly memorable role and the film is worth checking out because it is a classic in its own right but also because it reveals a slightly different side to Wilder’s talent. The second pairing of Wilder and Richard Pryor proved more successful than the first (see below) because it placed these comedians in situations where they could shine. The idea of Wilder and Pryor (as a playwright and an actor) in prison and trying to act tough provided a lot of opportunities for them to play to their strengths. The film also tapped into Wilder’s good-natured persona in unexpected ways. Woody Allen directs Wilder in a segment about a doctor who falls in love with a sheep. Really do I need to say anything more to make you want to check this out? Wilder launched his directing career with this spoof about the great detective’s overlooked brother. He turned to Brooks regulars Madeline Kahn and Marty Feldman for support and although the film is not as good as his collaborations with Brooks, it delivers an enjoyable outing. Wilder would also direct himself in The World’s Greatest Lover, which had some hilarious moments, and a string of middling comedies. This remains his most successful directing achievement. Kudos to Arthur Hiller for pairing up Wilder and fellow comedian Richard Pryor in this comedy thriller. This earlier film isn’t as good as Stir Crazy but it deserves a look for being the first to bring these two comic icons together, and their scenes together are wonderful. It was also a big box office hit. Wilder met his wife-to-be Gilda Radner in 1982 while making Hanky Panky. Their off screen romance endeared them to fans and was genuinely sweet. (Tragically, Radner would die of ovarian cancer only a few years later in 1989.) But their chemistry is preserved in a handful of films. Woman in Red was a film that Wilder wrote and directed, and it’s probably the best example of their on screen work together.